When I first wrote about the original English version of GUIDE in 2014, including it as a complete chapter in my book DID YOU KNOW (Vol. 1) - it was all about the film’s conception, making and box-office performance, sharing interesting facts not known to many young lovers of Hindi cinema. But now before releasing the ‘Revised and Expanded Edition’ of the book, here I am sharing a detailed scene-wise story progression of the rare film, that is still unavailable for the viewers, seen by a very few lucky ones at the time of release or later. So now post this write-up, GUIDE in English will no longer remain an unknown mystery for all, knowing the exact details of the script and its major deviations. 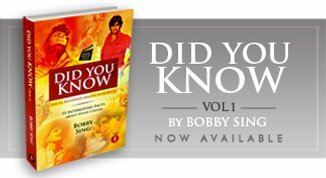 For young readers born post the ‘80s, the scene wise story progression is written in exactly same format as it used to get published in all the leading Hindi film magazines in ‘70s and ‘80s of many new and upcoming films. Many a times we excitedly used to read them assuming that we were actually watching the film without buying a ticket. I hope the present write-up is able to generate a similar kind of feeling for all the new and old friends of Bobby Talks Cinema. • The film opens with a slide saying “Stratton Productions Feature”. The very first shot/scene introduces Raju -The Guide (Dev Anand) refusing to accept cheque from his tourist clients and telling them – “Cash is preferable”. • The credits start coming on the screen and continuing the same long shot Raju moves towards two statues and informs the group of tourists that the monuments were erected in 1872 by the ex-viceroy of India. As the group moves away from the statues, camera pans downwards focusing on the engraving at the bottom of the boundary-wall saying “Made in Japan – 1936” (straight away proving the Guide as fraud in the very first scene). • Showing them a majestic palace and its various sections, he keeps informing them about the history, also making them laugh at times and quotes 200 Rupees extra when a tourist asks him about availability of dance and girls in the town. Hearing the cost the tourist walks away. • Raju also has a small shop/stall at the railway platform that has a board “Raju Gift Shop” on the top and is looked after by a small boy, who usually doesn’t give all the money earned to Raju. • The train Raju was waiting for arrives at the station with both Marco and Rozy. They get to meet Raju the guide and right there Rosie tells him that since her husband will be busy in temples and statues, so she would like to see King Cobra which can dance to the music of a flute. Raju takes them to the Anand Bhawan Hotel in an open car, moving through the local lanes, markets, houses, people and children (running behind them). The driver of the car is a pathaan (Anwar Hussain). • Raju wears new Kurta and his mother (Leela Chitnis) asks whats the occasion. He behaves as a child in front of her and asks her to tell him a story putting his head in her lap. The mother tells him a story of a devotee of Lord Krishna and Raju starts falling asleep in between. • Raju comes to the hotel to take Marco and Rozy on the city tour. But Marco says he knows where to go and would be back after a while. Raju meets Rozy instead and tells her that he can show her a cobra. Rozy moves out with him. • They both reach the place where many snake charmers are making the cobra dance to their tunes (been-music). We have the famous Snake Dance here wherein Rozy also dances with the local woman. Raju is stunned watching her dance with such amazing grace. • Raju is calling someone in his sleep and sweating when his mother comes and calms him down. Raju tells her about Rozy and her Snake Dance. Mother says that its bad luck. She tells Raju another story. • Raju takes Marco and Rozy to the caves where Marco gets busy with his work watching Lord Shiva engravings and statues. Raju spends time with Rozy and she talks about her married life. Rozy teases Raju saying that you are like a brother to me. Raju say NO! He asks her why she married Marco. She tells him all about it and their flirt begins. • Their conversation continues till evening when they suddenly see a tiger in the woods. Raju holds Rozy and Marco shoots at the tiger and then gets angry seeing Rozy in Raju’s arms. Rozy says she wants to go back home. Marco asks Raju to take her back to the hotel. • Raju drops Rozy at the hotel and goes back to his house with Anwar, who reminds him on the way that he is getting involved with a married woman. Raju tells him that she is like my sister. Anwar laughs saying “I know you are fooling me”. • Raju takes Rozy to a city tour, they visit a temple and watch people dancing and playing with colours celebrating the festival of holi. • They come back at hotel. Raju enters into her room and closes the door. • In the caves, Marco accidently finds some hidden statues falling into a pit and feels ecstatic. He asks the attendant to inform Raju and Rozy. • Back in the hotel Raju and Rozy spend the night together (crossing the moral barriers of a relationship with a married woman). Anwar knocks at the door in the morning informing them about Marco falling in a cave. • Rozy comes to the caves where Marco has found a new hidden section and now wants to stay and write a book about it. Rozy informs him about her desire to dance and tells him that at least Raju-the guide believes in her dancing skills. Marco doesn’t approve her dancing to a stranger. And when she tells him that she danced for Raju in a room Marco gets disturbed and seriously angry. He sends all the workers home. They have a quarrel that ends on a bitter note when Marco calls her a whore and a cheap woman. • Marco fires Raju as his guide and at home mother scolds Raju saying that he is behaving weirdly nowadays. Raju roams on the roads at night, walks away from his shop at the platform, walks through the market, spends some time besides a lake alone and is visibly disturbed. • Rozy visits Raju’s home with Anwar bringing along her luggage. Raju introduces her to the mother. • Raju and Rozy are talking to each other in a boat. Rosy tells him that Marco has left the city without her and now she doesn’t want to think she is married. Now she wants to be an artist and dance. • Rozy is practicing her subtle dance movements in Raju’s home. Raju is watching her lovingly and they both kiss. • The local people taunt Raju’s mother about Rozy, a married woman and a dancer staying in their house. • The young boy at Raju’s shop at the platform also says the same thing. Raju slaps him hard that becomes an issue as his father (Janaki Das) comes there. The station master informs Raju that his license has been given to another person and now it’s not his shop. Raju gets in fight with the new owner when Rozy comes there on the platform and takes Raju away. People keep teasing her calling ‘the dancing girl’. • A notice is served to Raju at home (most probably for the fight at the platform shop). In the court, Raju meets a lawyer who calls himself as the famous ‘postponement lawyer’. He gets Raju’s case postponed taking the only 5 Rupees Raju had got. • Raju returns back home to inform Rozy about the case being postponed. • Rozy and Raju decide a new name for Rozy as Nalini and she starts giving dance performances beginning from a school. • Nalini becomes a star and Raju is her manager. Journalists and people are there to receive Miss Nalini at the airport. Both Nalini and Dev get into the car and reach their palace. They now live in a big mansion. Many organisers are there asking for Nalini’s dates. • Raju checks all the letters coming for Nalini. He calls Nalini asking her that does she want to go to Madras. Rozy calmly tells him, “You never me ask me these things. I know what you want. Not tonight” and she disconnects the phone. Raju doesn’t mind and says “Miss Nalini is tired”. • Suddenly Raju sees a packet in the mail addressed to Rozy Marco. He opens it and finds the new book written by Marco dedicated to Raju –the guide. He hides the book in the safe, doesn’t tell anything to Rozy and starts drinking. • Raju gets up from the table where gambling is on (within their home itself). He locks the safe and moves out. A friend (Iftikhar) suspects something & says, “He never used to lock it”. • Raju comes to the room where Rozy is having a good time with her friends and dance troupe. Raju asks her to send them away as he has also sent his poker friends. Rozy refuses and again says ‘not tonight’. She agrees for ‘tomorrow night’ - to which Raju gets annoyed as tomorrow she is supposed to dance at the British Embassy. They again have a quarrel and Rozy asks him to go to his card players. • Raju comes back to his room where the game has stopped since Iftekhar the police officer has won the game. • Raju goes out with his friends visiting another place that happens to be a brothel. • Rozy as Nalini is giving her various dance performances and earning name and money together that is shown with a medley of her different dance acts and her troupe leaving a venue in a convoy of cars. • Nalini arrives at another event greeted by all followed by Raju. They are on a tour. Another letter comes addressed to Rozy instead of Nalini which Raju hides from others. • At night he calls Rozy in her room and suggests that they cancel the rest of the tour and spend a vacation in Kashmir. But she refuses …… yet again. • Raju reads the letter received which is about a box of valuable jewels Marco wishes to return to Rozy. Just then, Rozy enters the room bringing in a newspaper that calls Marco ‘the greatest authority on Indian art” quoting his new book. She is happy as it’s about her husband. Raju is not amused knowing she still considers Marco her husband. • Raju fakes Rozy’s signature and send the confirmation back to Marco for being ready to receive the box of jewels. • Nalini is performing in another program and that again is the snake dance being performed on stage. • The police officer (Iftikhar) comes up to Raju (in the ongoing show) telling him about the forgery of signature done by him. Raju request him not to reveal that to Nalini. The snake dance continues. • Nalini comes to the police station finding Raju behind the bars. She says, “How could you do that to me”. However, she still gets him out with the help of a lawyer. • The next scene shows Rozy lying on bed with Marco’s book and she throws away a newspaper with Raju’s picture behind the bar at Raju’s face. Raju tells her that this paper is three months old and she should now start dancing again. (So she had stopped dancing post Raju’s arrest on the charged of forgery). To that Rozy replies that “Don’t worry about the money. You will get it to defend yourself in the court”. • The lawyer tries to find a solution talking to both Raju and Rozy but Raju is now in a completely different unexplainable state. Raju goes behind the bars again. • Rozy meets Raju in the police station on request of Raju. But that again results in a heated conversation and she leaves forever. • Post serving his sentence, Raju comes out of the jail and keeps wandering in the search of a job in various cities (Bombay, Delhi and more). He sells a few of his belongings to get some money. • He reaches a travel agency but there the owner recognizes him as Miss Nalini’s manager. • Raju travels through various means and cities including Jagannath Puri. He then accidentally reaches a village. Here we for the first time hear 'an alaap by a male' in the background (of just a few seconds) during his travel on a cart. • Raju finds the ruins of an old temple and sleeps there. In the morning he finds a villager (K. N. Singh) standing in front of him. They have a conversation and the villager is impressed. He discusses his personal problem with Raju to which Raju quotes Buddha in return like a mystic. • The villager brings him gifts, clothes and fruits. Raju starts telling him the stories he had heard from his mother. • As the villager’s problem gets solved, more people start coming to Raju living in the ruins of the temple and they start assuming him to be some kind of enlightened saint. Raju also starts behaving the same unintentionally. • The villagers come to him for the solution of severe drought being faced. • The neighboring villagers attack for supplies and there is a grave mess. Looking at the situation Raju falsely tells a boy that he will not eat till there is rain. But actually he is just thinking of moving out of the village. • As he is about to run picking all his things, the whole village comes to the temple praising his decision to go on fast till it rains. People assume that he was collecting all his things to distribute in the villagers only. • Raju gets caught in a strange situation. The villagers assume him to be a saint who has decided to sacrifice by keeping a fast till the clouds shower rains. They don’t give him anything to eat for days. He is forcibly made a mahatma and Raju has to accept it waiting for a moment to escape which sadly doesn’t come. • As the news spreads, more people start coming in from neighboring villages to meet the saint. The village-saint becomes the talk of the town and number of people reaching there increases from hundreds to thousands. • With no one allowing Raju to eat or drink, his body becomes frail in days and he loses the ability to walk or talk. The authorities also arrange medical facilities for him. • Journalists and filmmakers arrive at the venue to cover the rare happening. • And then as the last resort, the government requests the famous Miss Nalini to come and persuade the saint to break his fast before it is too late. • Nalini arrives and recoganises Raju being considered as saint by everyone around. But she remains silent. She asks him to come back but Raju is no more in the state of taking any decision. Unable to help him, Nalini goes back with tears in her eyes. • Raju again remembers the story told by her mother and says that the rain will soon be there. Saying this he dies on the shoulder on the same villager he met on the first day in the village and the film ends right there with no sign of rain. 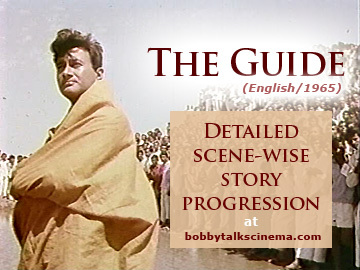 As a conclusion, GUIDE in English is certainly nowhere close to the classic Hindi film directed by Vijay Anand with music by S. D. Burman and lyrics by Shailendra. The film also has many sequences specifically inserted to impress the foreign audience as some kind of Bharat-Darshan, taking its focus away from the core subject. No doubt it couldn’t impress anyone abroad or at back home when it was released at only a few selected centers. Fact File: The film doesn’t have any songs but has a fabulous background music that grabs your attention from the very first scene itself. Interestingly the credits mention Music by S. D. Burman and Conducted by Rahul and Manohari. First of all sorry for the late reply as I usually reply all comments in the weekend, but somehow missed the last weekends. Thanks a lot for your encouraging words praising the effort made. My motive was indeed to make the film reach all the fans willing to watch it and yes there is no doubt that Vijay Anand added a lot into the script based on the novel of R. K. Narayan. Interstingly I have made this mention of Vijay Anand's valuable additions and RK Narayan's acceptance of the award in the chapter on GUIDE in the revised and enhanced edition of my book DID YOU KNOW Vol.1. It will be coming next month as its second edition in the market. Please do keep visiting and writing in. I will surely check and reply through e-mail. Please re-check if you have sent it on bobbysing@gmail.com (no 'h' in the end). Where I can find DVD of it? As mentioned in the article, the film was never released on DVD and in the present scenario will never be too. I luckily could see it through a friend and my main purpose of writing this article was to make it reach to all fans thought not in the form of moving images. Now the only chance now is if and when the ANANDs decide to release it through any online portal or anyone puts it on youtube unofficially. Lets hope it gets available soon for all.